Royal Circle level donors receive the most exclusive SVS experience! 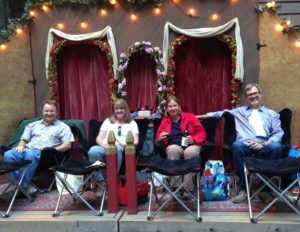 Enjoy a Sanborn Park production, or two, or the Willow Street Park production from our extra-comfortable lounge seating in our private royal seating area! You’ll also get an usher dedicated exclusively to royal seating – both pre-show and during intermission. We want every experience with SVS to be special. The Royal Circle is the most special experience of all. How does royal seating work? To keep this benefit fully tax-deductible, royal seating for Royal Circle donors is an automatic upgrade. For the price of one regular (donor-discounted) ticket, Royal Circle donors get that ticket automatically upgraded to royal seating! (Applies to the number of seats per production at your donor level.) Of course, at Willow Street there’s no ticket – Royal Circle members just reserve in advance! Anyone can reserve after their designated week, subject to availability. The exact reservation schedule will be directly communicated to Royal Circle donors.